We See Santa Arrive on Christmas Eve – on a Vespa | Sprezzatura, Y'all! Only in Italy. Late this afternoon, Christmas Eve, there was an event in the piazza. We saw the signs around town and thought we’d go, even though we and Google Translate couldn’t really decipher the signs. We knew it had to do with kids, because the signs had pictures of kids on them. So we gathered in the piazza to see what would happen. Every child in town was there, with their parents, grandparents, friends, aunts, uncles – you get the picture. There was a table set up near the big Christmas tree at one end of the piazza. Kids were running all over the piazza, anxious not only about what was about to happen in the piazza, but what was coming later tonight. Then all of sudden we hear a roar coming down the main street. 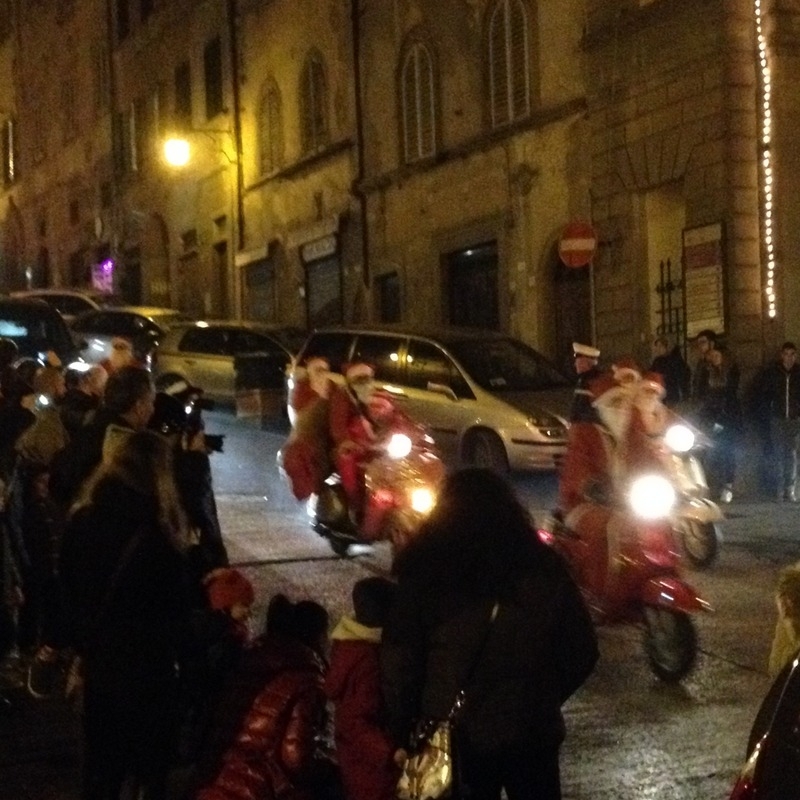 There were dozens of vespas coming down the hill, the riders all dressed as Santa with bags on their backs. They made a tour through town and wound up streaming through the piazza, parking underneath the tree. They all reached into their bags and threw balls to all the kids in the piazza. 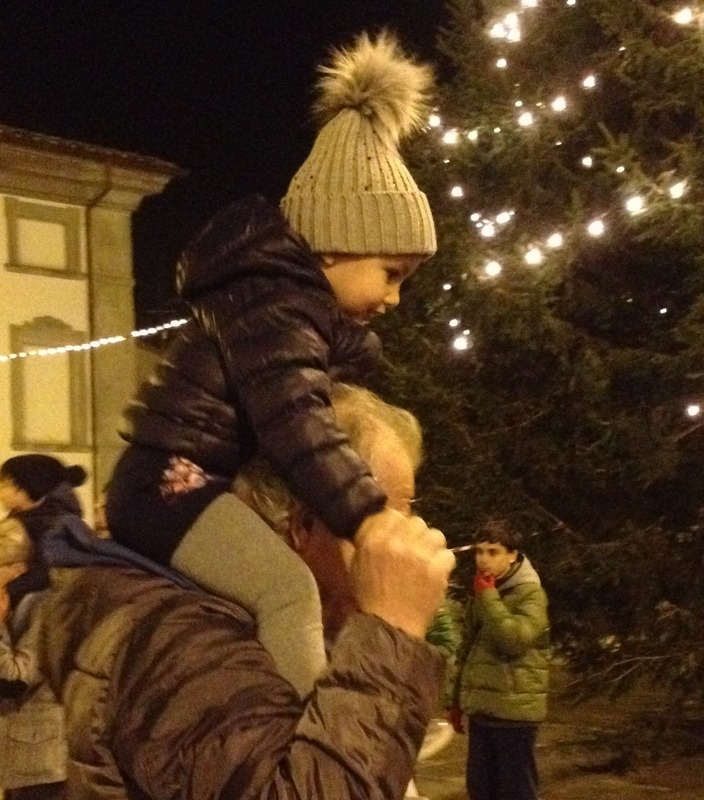 And so we have come to Christmas Eve here in Anghiari. Just when we’re missing our family more than ever, we’re once again drawn into the fabric of this community. Right after we got back home from the Santas on the Vespas party, we had a knock on our door. It was our neighbor, Jonpietro. 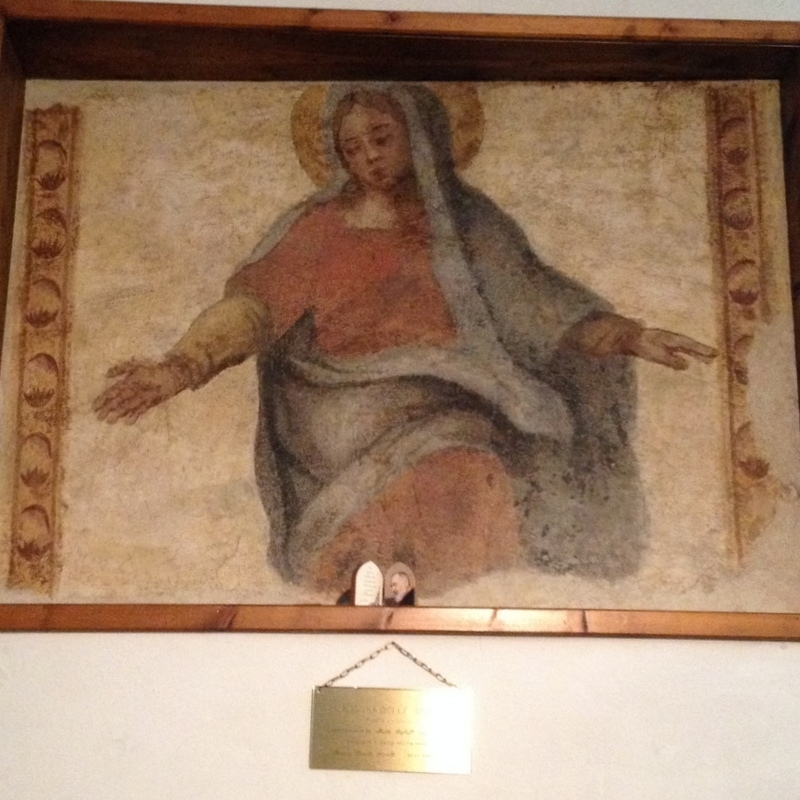 He motioned us to come into his house and showed us around, pointing out a wonderful fresco that was uncovered when he renovated the place. We talked as much as we could with our pitiful Italian and his non-existant English. Then he gave us a Christmas present. A panettone and another cake from the village bakery. What a wonderful gesture to two homesick Americans. To all our friends and family back in Atlanta, Buon Natale. We miss you all very much and hope you have a wonderful holiday. 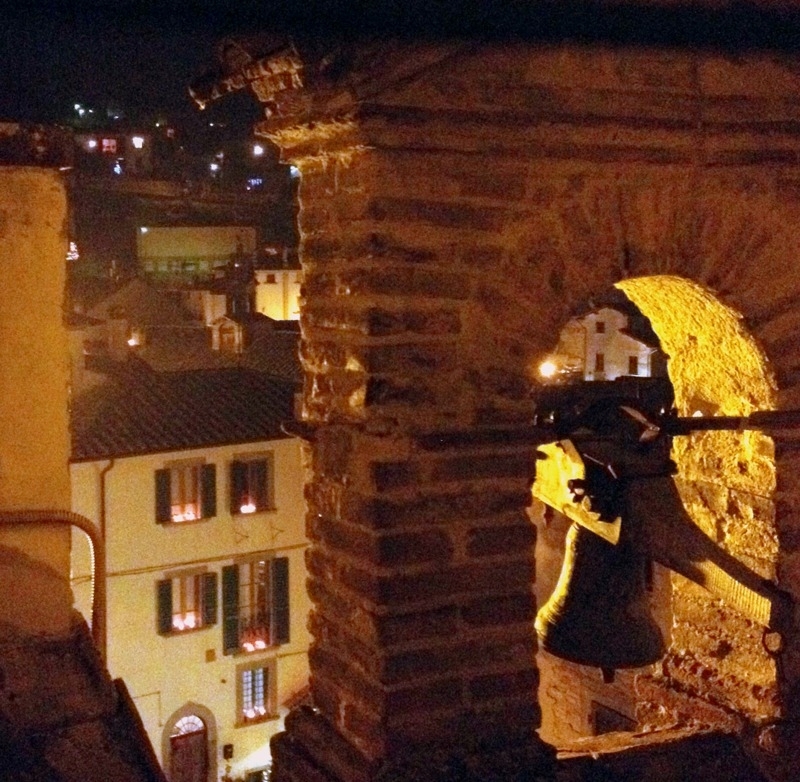 We’re here in our little medieval Tuscan village, with the candles glowing in the windows and doorsteps. It’s a Christmas we’ll never forget, for many reasons. Tomorrow is Christmas and we’ll celebrate that with our friends Michelangelo and Rosella, but tonight we’re together in our ancient little apartment. We’ve been given hugs and gifts by our dear neighbors and we feel loved. We feel like we belong here for now. We feel good and we wish everyone we know and love the same feeling. Peace and joy. That’s the best thing we can offer. Fantastic, Cathy! This brought tears to our eyes! Merry Christmas dear friends! Merry Christmas to you, too! Miss you all so much – hope you have a wonderful holiday. So fun and lovely! Merry Christmas, Cathy! i miss you lots of love. Miss you, too! It’s only a few weeks before we’ll back home, though.